• Research reveals benefits for students who receive arts education, prompting the researchers to conclude that arts education should be funded and expanded. • How can funders work to expand arts educations, particularly to disadvantaged students? • Learn more about the benefit of arts education. Following a steady increase throughout most of the 20th century, arts education opportunities in the United States have been in steady decline since the 1980s (Hamilton et al., 2007; Rabkin & Hedberg, 2011; von Zastrow & Janc, 2004; West, 2007). This trend has not been equitable across student subgroups. Over this period, white students have experienced virtually no change, whereas AfricanAmerican students have experienced reductions of 49 percent and Hispanic/ Latinx students by 40 percent. Moreover, children whose parents have less than a high school education have experienced a 77 percent decline (Rabkin & Hedberg, 2011). Childhood arts experiences predict arts participation and engagement later in life, meaning that decreases in childhood access likely has lasting effects. These trends are especially concerning in Houston, where 86% of students enrolled in the Houston Independent School District (HISD) are African-American or Hispanic/ Latinx (HISD, 2017). Moreover, in the 2012 Houston Arts Survey, it was reported that nearly 60% of respondents had attended at least one artistic performance in the past year; however, participation plummeted to 29% for individuals from households with incomes at or below $37,500 (Klineberg, Wu, & Aldape, 2012). The arts have intrinsic benefits for participants, but advocates also contend that the arts play a vital role in public education because they enhance skills and knowledge that transfer to student performance in other academic subjects, positively affect social and emotional learning, and enhance artistic ability and creativity which are valuable skills in today’s economy. (Deasy, 2002; Eisner, 2002; Winner, Goldstein, & Vincent-Lancrin, 2013; Winner & Hetland, 2001). However, the arts remain a prime target for cuts when education administrators and policymakers face accountability-driven tradeoffs (Yee, 2014). Since the passing of the No Child Left Behind Act (2001), the emphasis on standardized testing in “core subjects” has coincided with notable declines in school-facilitated arts exposure (Gadsden, 2008). There is a strong link between the emphasis on accountability testing and decreases in time and resources for the arts and other non-tested subjects (Bassok, Latham, & Rorem, 2016; Government Accountability Office, 2009; Guzenhauser, 2003; West, 2007). Moreover, evaluations of education programs and policies increasingly rely on empirical evidence, yet the causal benefits of the arts have rarely been rigorously investigated with experimental methods (Winner & Cooper, 2000; Winner, Goldstein, & Vincent-Lancrin, 2013; Winner & Hetland, 2001). As a result, policymakers and administrators struggle to make the case for the arts in K-12 schools, and advocates lack evidence to quantify the costs that come with decreases in access. An increasingly common strategy for addressing K-12 arts educational inequities is the formation of school-community arts partnerships. Typically, these partnerships consist of school- and district-level administrators, cultural institutions, philanthropists, government officials, researchers, and a “backbone” organization that facilitates these collaborations (Bowen & Kisida, 2017; Perille, 2016). Successful partnerships have flourished in many urban school districts, including Boston, Chicago, Los Angeles, and Seattle. One such partnership, Houston’s Arts Access Initiative (AAI), launched in 2013. This multi-sector, collaborative effort aimed to advance student access to the arts through “strategy, partnerships, data collection, and advocacy.” The AAI vision statement was “that every student in Houston will have the opportunity to benefit cognitively, creatively, emotionally, and academically through the arts,” with an emphasis on foundational goals of equity, impact, and sustainability. As with arts education research in general, only a few studies have investigated the effects of these partnerships (Catterall & Waldorf, 1999; Rowe, Werber, Kaganoff, & Robyn, 2004). Preliminary research suggests that school-community arts partnerships improve academic achievement and attainment (Catterall & Waldorf, 1999); however, there is no causal evidence about the impacts of these interventions. After conducting a district-wide campus inventory, AAI stakeholders developed strategies to serve schools with the lowest levels of arts resources, primarily through forging and enhancing school-community partnerships. School participation in the Initiative was voluntary, and applicants were required to commit to a monetary match earmarked for arts experiences through teaching-artist residencies, in-school professional artist performances, field trips, and afterschool programs. Demand for AAI participation exceeded supply in the first two years of implementation. Forty-six campuses applied to participate in the first year of the AAI, and 35 additional campuses applied to participate in the second year. After consulting with our research team, AAI stakeholders agreed to randomly allocate participation among 42 schools in the first two years and deferring AAI participation for the other applicants. In addition to being an impartial method for selecting AAI schools, this process was conducive to conducting a cluster randomized controlled trial (RCT). In this study, we investigate the causal effects of increases in elementary and middle school students’ arts educational experiences, provided through school-community arts partnerships in the first year of program implementation. Comparing AAI school gains to their randomly assigned counterparts, we find that increasing arts learning opportunities significantly reduces the proportion of students receiving disciplinary infractions, increases writing achievement, and increases compassion for others. We do not find significant effects overall on student attendance, math, reading, or science achievement, or other survey-based measures. For students in elementary schools, which were the main emphasis of the Initiative and comprised 86 percent of our school sample, we find that the intervention also improves student engagement, college aspirations, and arts-facilitated empathy. We also find that these effects varied substantially by student subgroups. 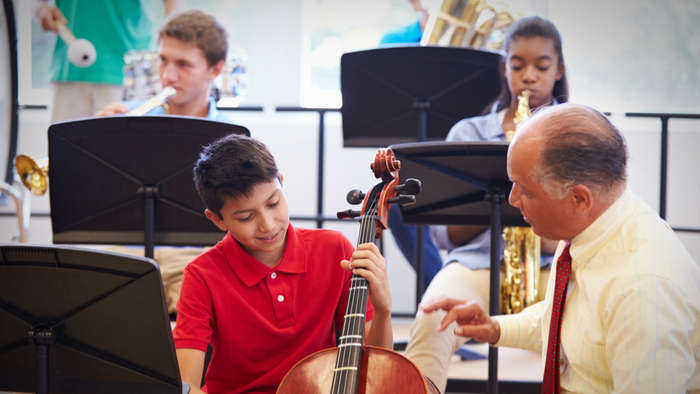 Students receiving “limited English proficiency” (LEP) and gifted and talented (GT) program services appear to benefit more from these arts learning experiences. These results provide strong evidence that substantial increases in arts access can produce significant, multifaceted educational benefits for students.